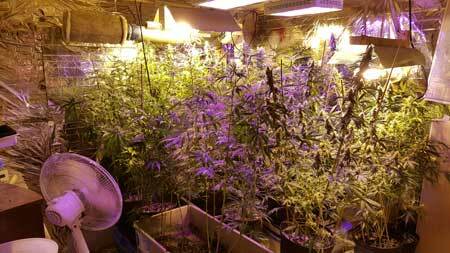 If your cannabis plants get too tall for your grow space, you're not alone; it's a really common problem for indoor growers. A cannabis plant's ability to grow very tall in a very short amount of time can (and frequently does) get growers into a lot of unexpected gardening trouble! 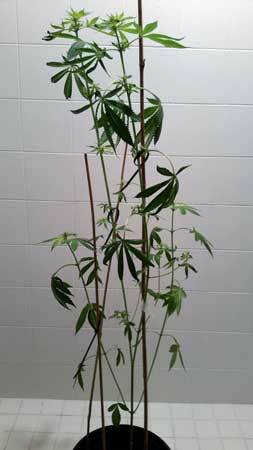 If you need help with a marijuana plant that's too tall, this article will teach you what to do! What Can You Do When Marijuana Plants Start Getting Too Close to Your Grow Lights? 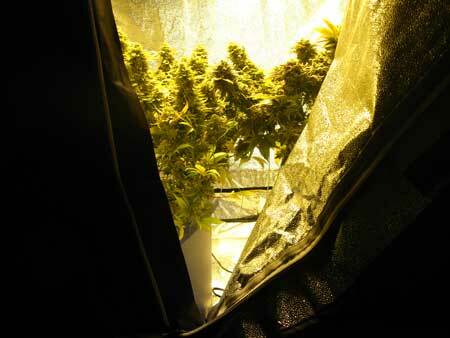 One of the biggest risks of having too-tall plants is burning your buds by keeping them too close to the light. Even if the temperature is under control, your buds and leaves can still get bleached or burned if the grow lights are too close. 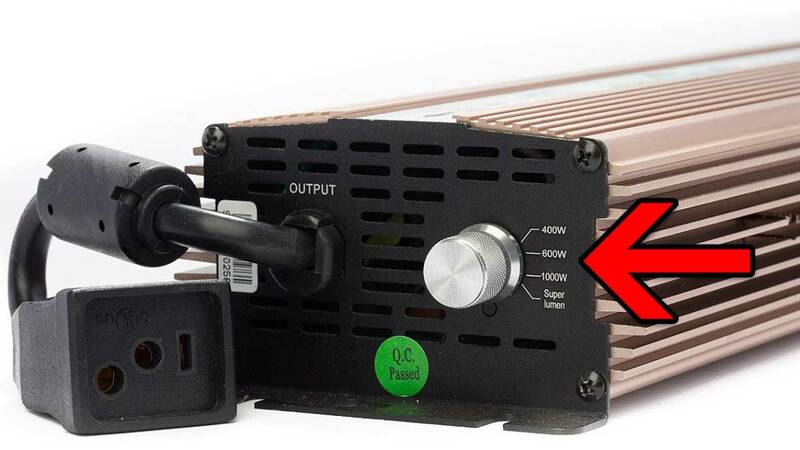 This can especially common with LED grow lights, which run cool but are extremely powerful. 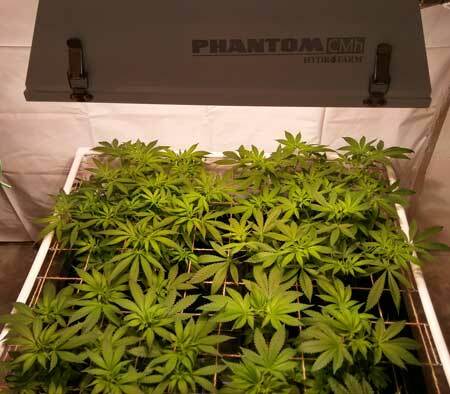 Most LED grow lights should be kept 18" or more from the tops of your plants. Learn how to avoid problems with LED grow lights. With most other types of cannabis grow lights, including CFLs, T5s, LEC and MH/HPS, if the light is far enough away that it feels comfortable to the back of your hand after 30 seconds, it's probably far enough to be comfortable to your plants. That being said, it's a good idea to familiarize yourself with how far away to keep your grow lights from the tops of your plants. If your plants are still in the vegetative stage and your plants have completely overgrown your space already, you can actually cut down your plant to make it shorter. Vegetative cannabis plants will survive and keep growing as long as they have plenty of leaves left; the downside is all that growth you cut off equates to lost time and energy. 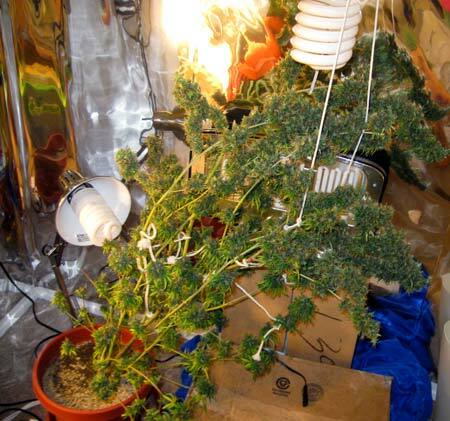 This method involves reducing plant to half the final desired height via pruning, then change to the flowering stage within the week by putting your grow lights on a 12/12 light schedule. Plants can double in size (or more!) after the switch to 12/12 so you want to start flowering as soon as possible if you're already worried about height in the vegetative stage! Learn more about light schedules and the flowering stretch (how much a plant grows after entering the flowering stage). This grower lost track of time and now his plant is huge, even though it's still in the vegetative stage. If he switches to the flowering stage now, the plant may double in height or more, which would make it taller than the room! If bending doesn't work to shorten the plant, the grower might consider cutting off some height from each stem before switching to 12/12. The light levels are most intense directly under the grow light, so it can be helpful to move the tallest plants and colas away from the middle, and toward the edges of the grow space. Use bending if possible to reduce the height of the tallest branches. Spreading out your plants so they're flat helps to ensure all parts of the plant are roughly the same distance from the grow light. 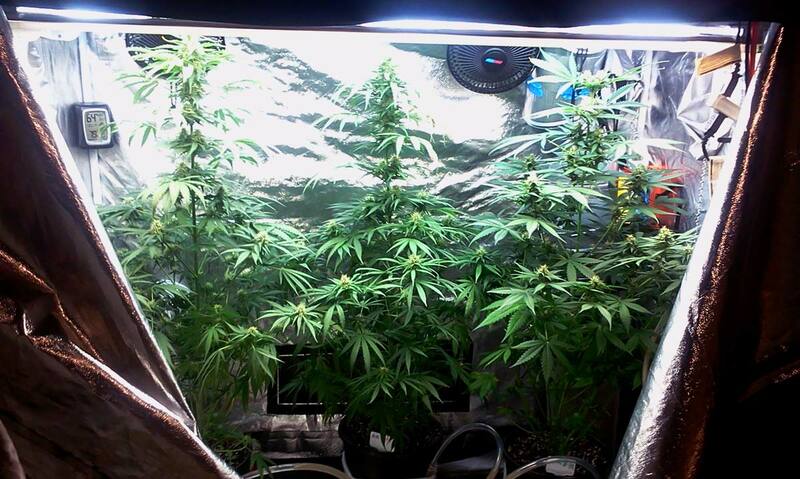 Additionally, a wider canopy creates more bud sites, which results in notably larger yields. This is best done while the plant is still growing in the vegetative stage because stems are still flexible, but you still can sometimes successfully bend stems that have stiffened. You may need to become good at a technique called "supercropping" to prevent breaking if you have very stiff branches that need to be bent over. Don't just force a stem that feels wooden, or it will snap! Learn about low-stress training and supercropping your cannabis plants. This plant is very tall, but not wide. Plants grow like this when grow lights are too weak or kept too far away. The grower could bend this plant over almost from the base, and they have enough room to really spread the plant out under the grow light. 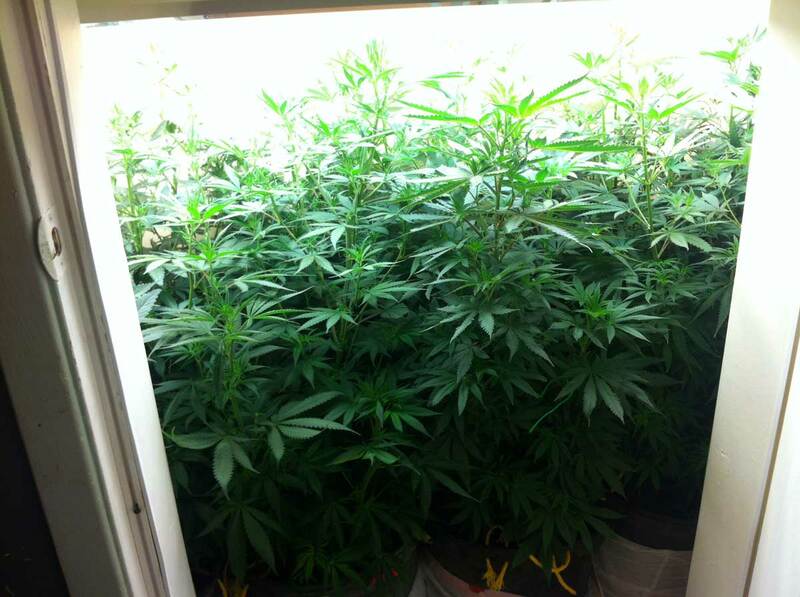 In this next picture, simply bending over the tallest colas would remove over a foot of height from these plants. Supercropping may be necessary to avoid breaking the skin when bending stiff stems. When you have many unruly colas, simply try your best to bend over the tallest ones towards the edges of the grow space. This plant grew right into the grow lights, so the grower bent the plant over as well as they could. They used nylon rope to hold the colas up until harvest, though a better alternative to nylon rope for holding up colas in a situation like this is plant yo-yos. Sometimes you can gain some extra height if you get creative. 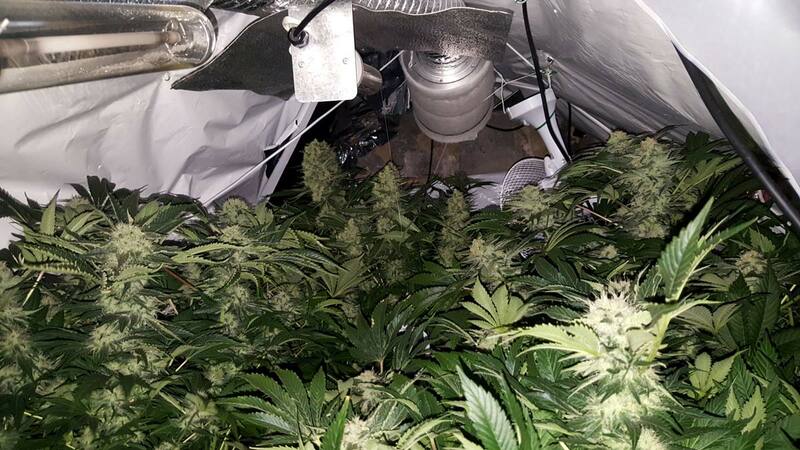 This grower attached his LED grow light almost directly to the ceiling (as opposed to hanging it from rope ratchets) in order to gain a few extra inches for his plants. If your plants are getting cooked, reducing the overall light intensity will help reduce the symptoms of both heat and light stress. Some types of grow lights have settings to reduce the intensity. If you are using more than one lamp (for example a mix of different types of grow light), you can turn off some of the lights. 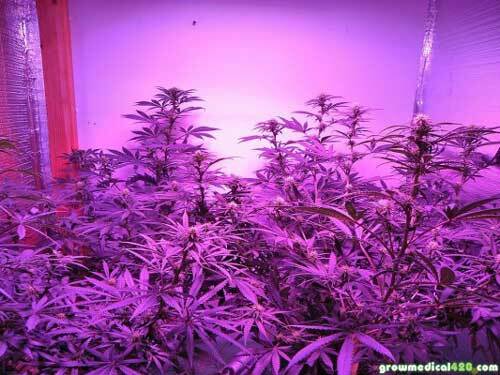 Some grow lights let you reduce the power, which lowers the light intensity and causes the grow light to run cooler. This can be useful during a heat wave or if plants get too tall! If the tallest parts of your plants are getting stressed by the grow lights, it helps to reduce the overall light intensity. If you have multiple grow lights, remove the ones that need the furthest distance from the tops of the plants. For example, LEDs typically need to be kept further away from your plants than an equivalent HPS. So, in the picture below, the grower could reduce light stress by turning off a few of the LEDs. High humidity is common with bigger plants. You want to keep it at 50% RH or lower in the flowering stage to reduce the chance of mold. Each leaf is constantly releasing water vapor into the air, so in addition to increasing the power of your exhaust or getting a dehumidifier, you might consider using defoliation to help reduce the humidity. Whenever removing leaves, try to stick to fan leaves that are in the middle/lower parts of the plant that aren't getting light, or fan leaves that are preventing buds from getting light. Learn more about defoliation as well as controlling humidity. 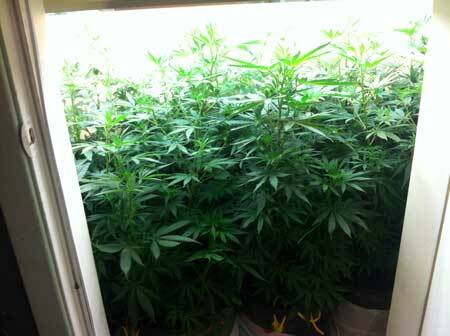 Fast-growing and healthy plants put out a lot of water vapor. 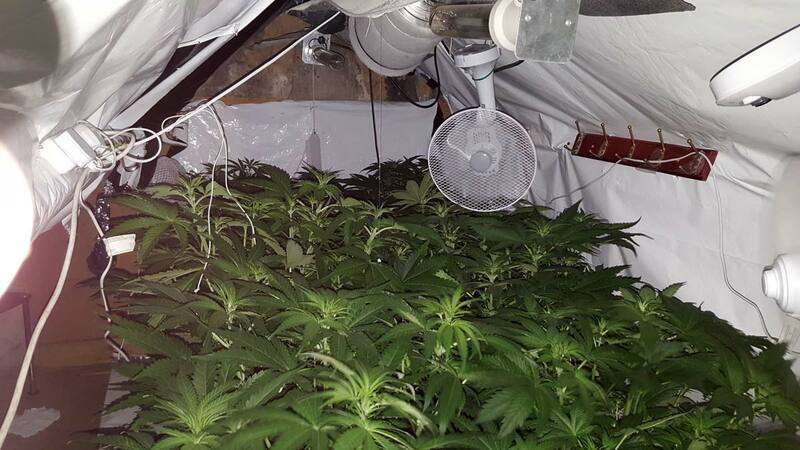 As a result, try to keep an eye on the humidity if your plants are starting to fill up your grow space! Just like with humidity, controlling temperature becomes extra important to avoiding stress when you've got plants that are close to the grow light. High heat is stressful to plants, and can damage the appearance of buds and leaves. High temperatures can also reduce overall bud smell or potency. Keeping the temperature between 70-75°F can help alleviate many symptoms of stress even when lights are still too close. Learn more about grow room temperature plus check out 5 Secrets to Controlling Heat. 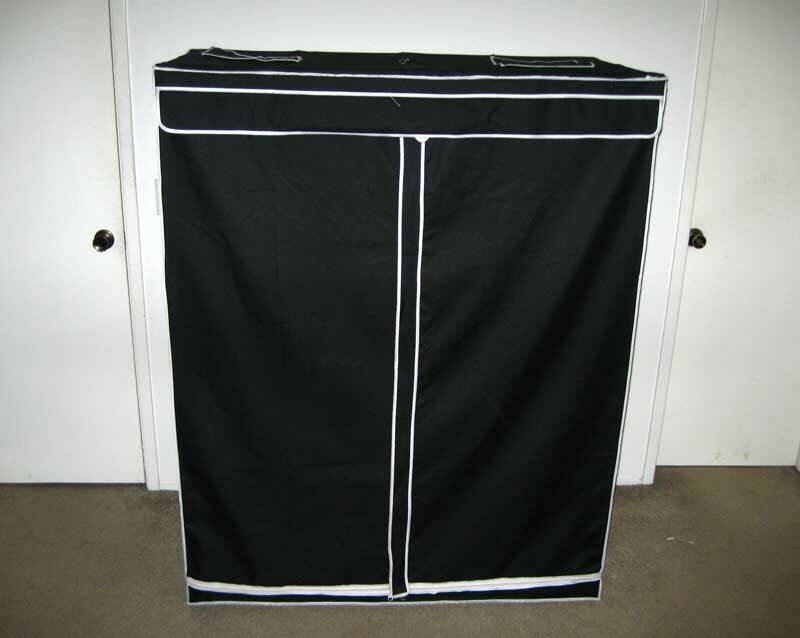 Obviously, this isn't an option for all growers, but consider whether you can get a taller grow tent or otherwise increase the height of your grow space. These plants outgrew their 5' grow tent, so the grower moved the plants into the room and constructed a barrier around them with white poster board. Although this is not a long-term solution (poster board is hard to clean, is tough to make light-proof and goes bad if it gets wet), it has okay overall reflection, it's cheap, and most importantly it helped the grower get to harvest without burning the tops of their plants! If you have a strain that's been growing taller for more than 6 weeks after the switch to 12/12, change to a shorter day such as 11/13 or 10/14, which will force the plant to fully start flowering and stop growing new stems and leaves. Why are cannabis plants taking forever to finish flowering? Basically, lollipopping is removing the bottom leaves of a plant, which gives it the shape of a tree or lollipop. If your plant is so tall that zero light is making it to the bottom leaves, it means your plant is wasting energy on those leaves. Any buds that grow in relatively low light will be wispy and never thicken up properly. Lollipopping a very tall cannabis plant can help it focus more energy on the top-most buds, which tend to grow the largest. Sometimes you need to harvest certain troublesome colas earlier than you'd like, and that's okay. You can harvest some buds now, and let the rest of them continue maturing until the optimal harvest time. Do Your Best, But Don't Beat Yourself Up! Do your best to hang on. Buds that get a little burned will still produce good effects; a little light or heat burn isn't the end of the road. It's important to remember that this a common problem that affects many growers indoors. It's happened to most growers, myself included! Sometimes you have to just hang on and do what you can. 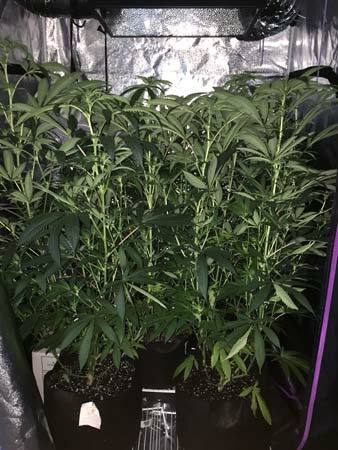 The grower didn't switch these plants to the flowering stage until after they were more than half the final desired height. Soon the plants were getting extremely close to the grow lights! The grower used supercropping to continue bending over the tallest stems, trying to ensure the tallest stems were at the edges of the grow space. He also controlled the humidity and kept the temperature at 75°F or lower. 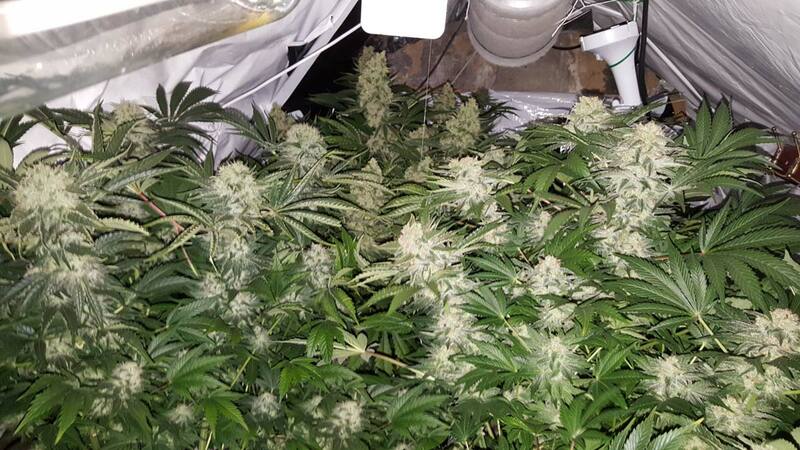 By just holding on and doing his best, the grower was able to produce an amazing harvest! 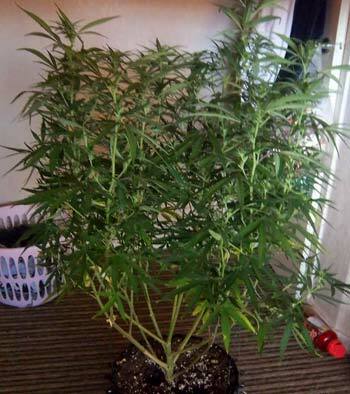 If you're growing in a short space, choose marijuana strains that tend to stay short. Although you can overcome a plant that tends to grow tall, it makes things easier to choose a strain that works with your goals. Focus on bending plants so they grow flat and wide. You want to "fill in" the entire grow space to maximize your yields indoors. Learn about low-stress training and supercropping your cannabis plants. Switch to the flowering stage when your plants are about half the final desired height, as plants tend to double in size after the switch. If you have a plant that's been growing very tall and stretchy its whole life, consider switching it when it's only 1/3 the final height, as some extremely tall strains can triple in height…or more! If the plant naturally stays stocky and short in the vegetative stage, typically it won't stretch as much in the flowering stage. Learn about the flowering stretch. You want to avoid keeping grow lights too close to avoid burning, but it's just as important to avoid keeping them too far away. When grow lights are kept too far away, plants tend to grow long and stretchy as they "search" for the light, which can cause them to grow far taller than they need. How far to keep grow lights from the top of your plants. 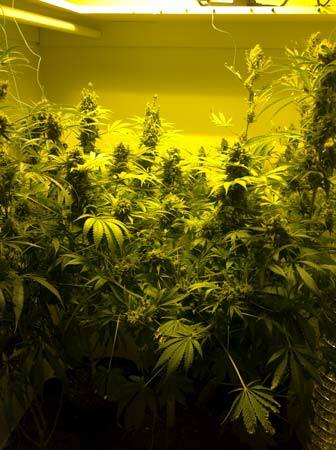 If you have only a short space to work with, consider getting a light that can be kept relatively close to your plants, for example, a T5 fluorescent, household LEDs, CFLs (the ultimate for tiny grows), or a 150W or 250W (which can be kept as close as a foot from your plants). 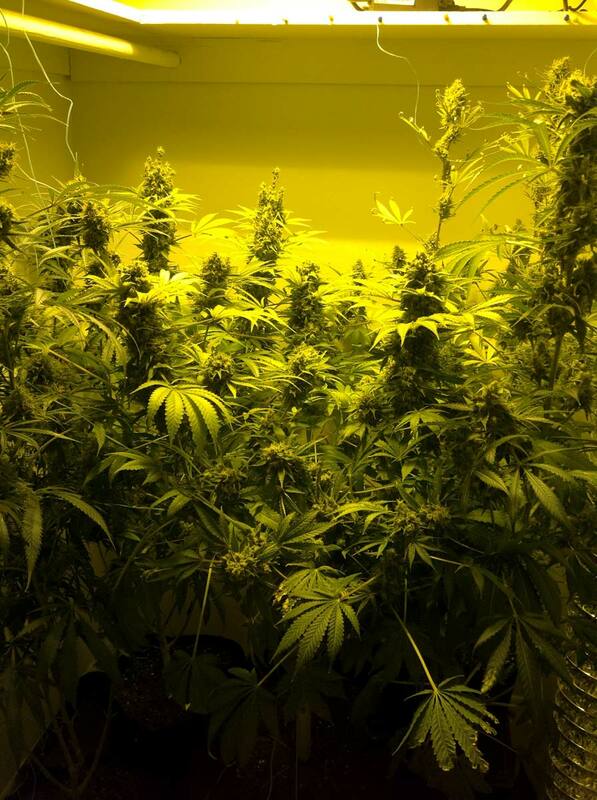 A Metal Halide light tends to keep plants shorter than an HPS, and they can be used from seed to harvest if desired (though yields are usually smaller than flowering with an HPS). Compare different types of grow lights. 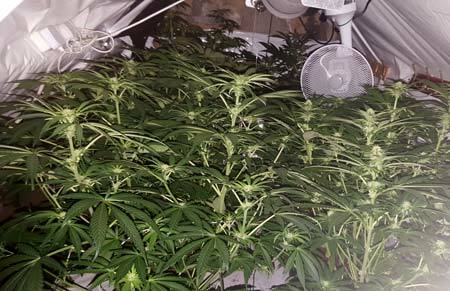 CFLs can be kept inches from tops of cannabis plants as long as it's not too hot. They are the best choice if you have a very limited amount of height. 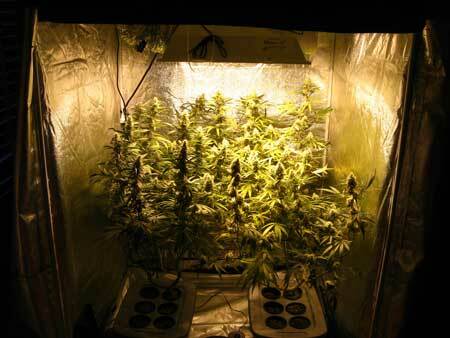 250W HPS grow lights are kept about 12" away from the tops of plants. A great mid-size light that doesn't get too hot or use a whole lot of electricity. 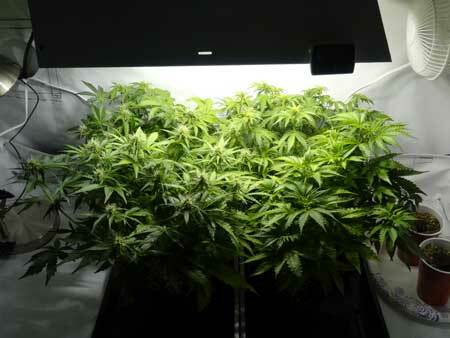 315W LEC grow lights are kept about 18" from the tops of plants. 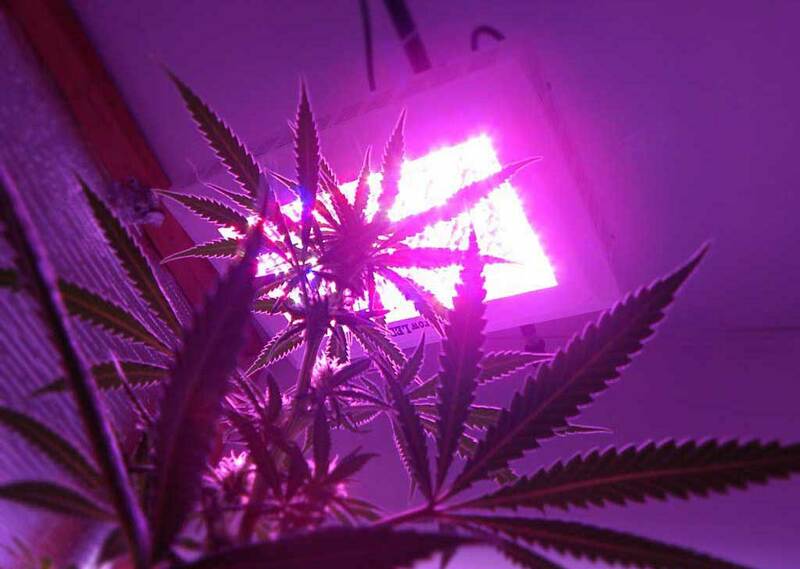 This style of grow light has recently become increasingly popular for marijuana growers. 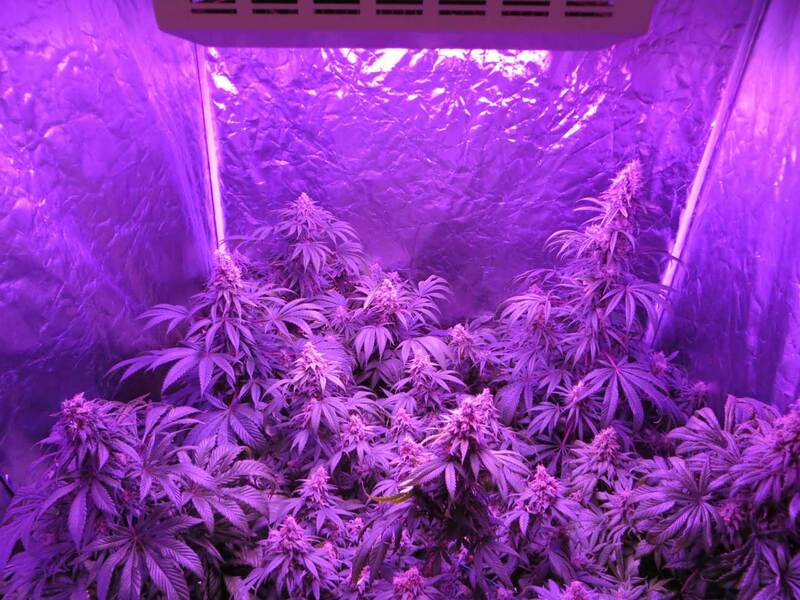 600W HPS grow lights are kept about 16" away from the tops of plants. Use the tallest grow space possible. 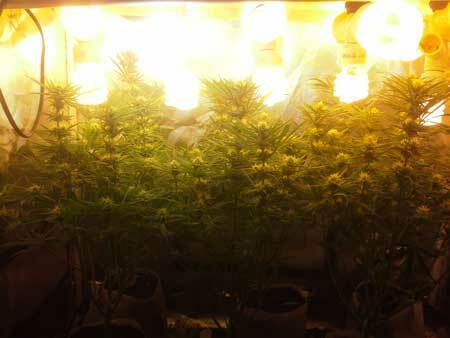 Once you have at least 6-7' of height, it becomes a lot easier to avoid letting your plants grow into the lights. How to choose the right grow space. I personally recommend new growers start with a grow tent, as it will give your plant the perfect environment for a relatively low cost! Grow tents are a cheap way to provide a great plant environment. Opt for the tallest tent you can fit! If you're getting caught up with a growing problem like bugs or a nutrient deficiency, or if life starts getting really busy, it can be easy to lose track of your plant's height. Next thing you know, your plants have overgrown their entire space! What is the Optimum Final Height for Cannabis Plants?